On 16 April, in celebration of Girlsday 2011, Greenlightforgirls.org helped Dutch company ASML give 500 girls and their mothers the greenlight to experience science and technology in fun and exciting ways. 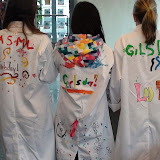 We were honored to contribute, along with several partners, to the first-ever such ASML event encouraging girls to pursue science and technology. Greenlightforgirls.org "DaisyChain" members led workshops on "Breaking Down & Rebuilding your Computer" and "Song of the Stars," and we carried out several activities in the ASML Tech Market, including Labcoat Decoration, the Daisy Experiment, Chemistry for Life and Dancing to Learn. It was awesome to be involved in an event which so perfectly reflects the greenlightforgirls.org mission to "promote science, technology, math and engineering to girls of all ages and backgrounds." Seeing the smiles and looks of wonderment all day long on the faces of the moms and girls -- and all the marvelous ASML and Greenlightforgirls.org volunteers -- was also a tremendous joy. Older PostFirst Denmark g4g Event also Celebrates "Girls in ICT" Day 2012!